The term "bibliotherapy" is a more common term than poetry therapy, which became popular in the 1960s and 1970s, which literally means the use of literature to serve or help. Freud once wrote, "Not I, but the poet discovered the unconscious." Poetry writing more than any other genre, resists the mind of everyone but the individual, the creative Self, the "I." In the years that I have been writing poetry with many different individuals and groups, I have come to respect more and more the indefinable place from which the poem comes, and the ability of each individual to travel to that source of creativity easily and naturally. A poem has much to teach us about ourselves and the world, as form and sound give rise to silence. One of the benefits of poetry reading and writing is not only does it help define the "I", but strengthen it. This is necessary if we are to be a part of the world. The process attaches us to the greater part of ourselves, to all that is whole and good and beautiful. And when we feel ourselves as not alone in the world, but a part of and integrated with all that exists, self-esteem grows. In looking at a poem from a therapeutic view, the emotional issues in a poem are explored and discussed. The poem is not evaluated from a literary perspective, however the music of the language and the ability of the poem to communicate from one person to another is very important. “When people are closest to their hearts speaking their truth, the poetry therapist will write down what they say and give them their words as a poem to be cherished and valued.” There is no judgment or criticism, only a listening. In poetry as therapy, people learn to listen to themselves more and more, and to respect their voice. When we hear anothers words that meet our experience, there is comfort in that. How often have we said to another, "I have often felt that way but could never find the words." There are many ways to be with poetry in a healing way. Certainly to read anothers poems, and discuss how they speak of your experience. And also to write your own and explore the issues. Often in discussion, another feeling will rise which gives thought to the next poem. In poetry, images rise from the unconscious which often gives birth to memory and words comeat first spoken and then written. This process brings clarity and order to what is chaotic or not understandable. When we are able to connect with something deep within and express it, there is a sense of relief and satisfaction in communicating first with ourselves and then another person. 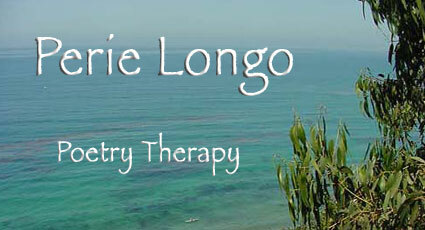 To learn more about poetry therapy, you may check out an article on this subject at http://www.spcsb.org/advoc/poetrytx.html, The National Association of Poetry Therapy web site at http://www.poetrytherapy.org, or contact Perie at Perie@west.net.